Need a better way to manage your social media marketing activities? Looking for a tool to show you performance metrics from multiple accounts in one place? In this article, you’ll discover how to use Cyfe to organize and analyze your social media marketing activities across several top networks and content channels. 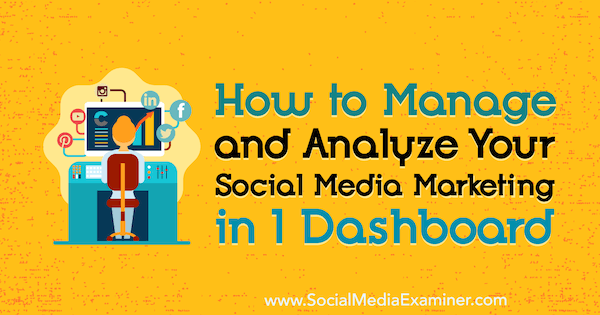 How to Manage and Analyze Your Social Media Marketing in 1 Dashboard by Mitt Ray on Social Media Examiner. Simply put, a social media dashboard is an analytics tool that integrates with various social platforms so you can monitor and gain insights from the metrics generated from all of your presences in one handy interface. A dashboard saves you a lot of time and headaches because you don’t have to jump from one website to another to view your latest social media data. It also makes it easy to compare the data from one social media account to another. Some social media dashboards also help you execute other marketing tasks like scheduling. Cyfe is a dashboard tool that lets you track analytics on top networks like Facebook, YouTube, Instagram, Twitter, Pinterest, LinkedIn, Vimeo, and more. It also has other features that can help with your social media management. Here’s an example of a Cyfe dashboard that allows you to view data from Twitter and Facebook on one screen. You can sign up for a Cyfe account for free. The free account lets you create a limited number of dashboards and widgets. If you want to create more dashboards and widgets or take advantage of other advanced features, you can sign up for a premium account, which costs $19 per month (per user). To sign up for a free account, visit the Cyfe homepage and fill in your account details. Click the link in the confirmation email to set up your account so you can begin using it to create your social media dashboards and widgets. Once you log in, your first dashboard will be automatically created. You can add your social media accounts to this dashboard. At the top of your dashboard, click the Add Widget button to add a widget to your dashboard. In the window that appears, click the Social Media tab and then click the Add button for the social network you want to create the widget for. Then click Configure to connect the social media account you want to track. In the Configure Widget window, enter the username of the account you want to track (yours or your competitor’s) and the metrics to include. The metric can be a general selection like Overview or something specific like Followers or Tweets. For example, if you choose Followers for the Twitter widget, the widget’s graph displays follower growth and shows the percentage increase in followers. To track other Twitter metrics, simply click the configure widget icon (it looks like a gear) and change the metric the widget is tracking. Or create a new widget to track the metric. You can create widgets for several social media accounts and quickly view all of their metrics in one dashboard to see if you’re meeting your social media marketing goals. Creating more dashboards makes it easy to organize your widgets. You can create dashboards for each social network, the social networks of each client, or different types of business tools. Cyfe integrates with ad platforms, website analytics platforms, email marketing platforms, and more. If you want to create additional dashboards for different brands or projects you work on, click the + icon at the top of the screen. Give the new dashboard a name and click Add Dashboard to start building it. Cyfe has a Mashup widget that lets you combine data from two different social networks, or data from a social network and another marketing tool to see if there’s any correlation. To create a mashup, click the Add Widget icon at the top of the dashboard. In the Add Widget window, open the Featured tab and click the Add button next to Mashup. In the window that opens, click Configure and then select the metrics you want to combine. After you save the widget, you can look for correlations and trends between the data from the social media platforms or marketing tools. For instance, if you ask people to follow your Instagram account in your YouTube videos, you can mash up data for YouTube views and Instagram follows to see whether views are turning into followers. If you see a correlation between YouTube views and Instagram follows, you may decide to continue asking people to follow you on Instagram. If there doesn’t seem to be a correlation, you might ask people to follow one of your other social media accounts or sign up for your email list instead. Then you can track the effectiveness of those calls to action (CTAs) with a new mashup. The Cyfe Publisher widget lets you schedule posts for Facebook, Twitter, LinkedIn, Pinterest, and Google+. To set up this widget, click the Add Widget icon. Then open the Social Media tab and click the Add button next to Publisher. 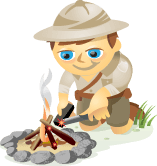 After you click Configure, add the social media accounts for which you’d like to schedule posts. After you add your social media accounts, you can begin creating updates and scheduling them with the Publisher widget. The scheduling feature is especially useful if you use Cyfe as a social listening tool. It allows you to respond to discussions and add your take on trending stories directly from where you’re tracking things already. To track your social media progress, you can also set up alerts and goals in Cyfe. When you set up alerts, Cyfe will inform you via email or SMS when a certain numeric figure is reached. To illustrate, you can be alerted every time one of your Facebook posts achieves 500 organic impressions. To set up an alert, click the bell icon in the upper-right corner of the widget. In the Widget Alerts window, configure the conditions for which you want to be alerted. Try setting the widget to inform you when organic impressions are equal to or exceed 500. Then type in the email address or phone number to receive the alert and click Create Alert. Cyfe will now contact you every time your organic impressions reach 500. This way, you’ll know immediately if you need to monitor comments on the post more vigilantly or might benefit from promoting the post even further with ads. Goals, as the name suggests, lets you set goals on your widgets to make it easy to visualize what you want to achieve with your social media marketing. To set goals, click on the flag icon (next to the bell icon) and type in all of your widget goals. For the Twitter metrics widget shown below, you can set goals for followers, favorites, tweets, and so on. To make sure your social media marketing efforts are generating positive results, you need to regularly analyze your metrics. Most top social networks offer their own built-in analytics, but logging into each social network and checking analytics individually can take a lot of time. The solution is to use an inexpensive social media dashboard like Cyfe. It lets you not only view all of your social media metrics in one place, but also place them next to each other and compare results. What do you think? 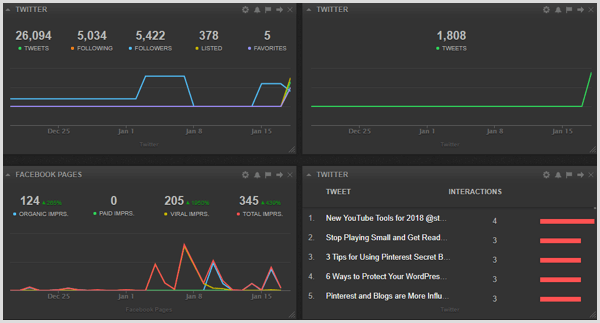 Do you use a social media dashboard to track your metrics? How has this helped your business? Please leave your comments below.